Mechanically decontaminate even the smallest areas! Cobra Clay Pad is a 4 inch paint decontaminating pad that uses a hi-tech, rubberized coating to remove surface contaminants from paint on one side, and a hook and loop fabric on the other. Perfect for use with a 3 or 4 inch backing plate, Cobra Clay Pad allows you to clean even the smallest area on your vehicle’s paint. 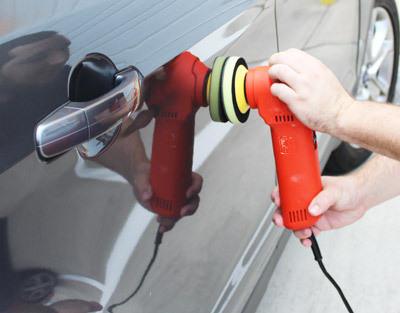 With little to no effort tree sap, over-spray, tar, stubborn road grime, dirt, industrial fall-out, and so much more will be removed from your paint to fully prep your finish. With so many paint decontaminants on the market today, (clay bars, synthetic clay mitts and pads, chemical decontaminants), there really is no excuse not to have perfectly clean paint! Cobra Clay Pad advances that even more by allowing you to reach even the smallest areas. Before Cobra Clay Pad, you could use a synthetic wash mitt on the larger panels, but you’d need an old-fashioned clay bar for the smaller areas. Cobra Clay Pad is perfect for use with the Griot's Garage 3 Inch Orbital Polisher! But not anymore! Use Cobra Clay Pad to easily decontaminate the area between windows, small bumper panels, around delicate trim pieces, and many other small areas that aren’t easily reached. By using a synthetic, rubberized coating that mimics traditional clay bars, you save yourself the hassle that comes with traditional clay bars. The Cobra Clay Pad is strong enough to be considered a “medium grade” contaminant remover, but is also gentle enough on paint to be considered a “fine grade” as well. You won’t have to worry about having multiple different clays grades since Cobra Clay Pad will do both jobs for you! Use Cobra Clay Pad on a 3 or 4 inch backing plate.